During the Cavaliers' introductory press conference for its owner last week, Andrew Bynum's hair was dressed in subtle braids, ceding center stage to the owner of Andrew Bynum's hair and prompting concerns that this might be the end of Andrew Bynum's hair as we once knew it. Should Andrew Bynum Cut His Hair? The internet can now breathe a sigh of relief. 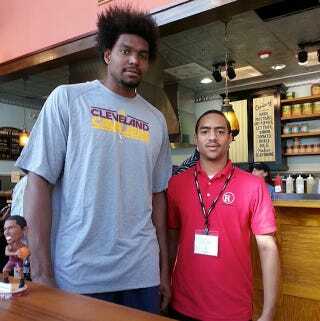 Reddit has given us the first confirmed sighting of Andrew Bynum's hair in Cleveland. Reached for comment, Andrew Bynum's hair would only say it feels good to get back out there and reconnect with fans.